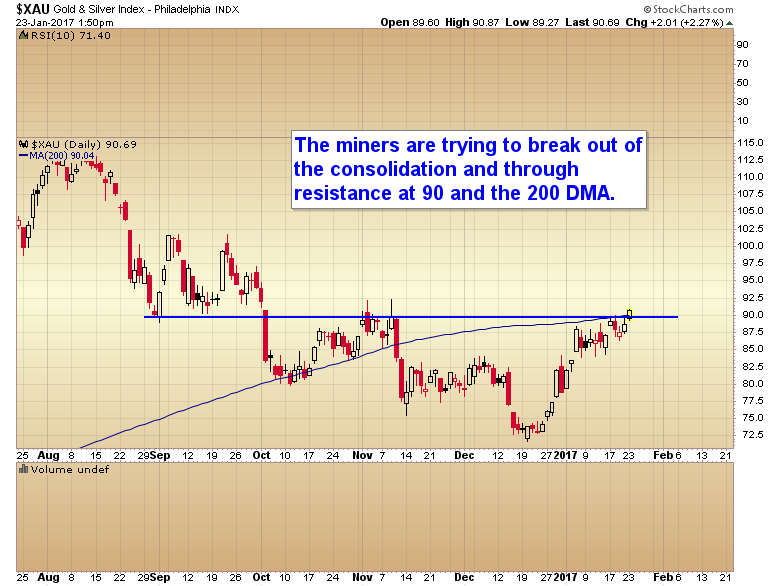 CHART OF THE DAY – BREAKOUT? This entry was posted in Uncategorized on January 23, 2017 by Gary. This entry was posted in Uncategorized on January 22, 2017 by Gary. This entry was posted in Uncategorized on January 20, 2017 by Gary. This entry was posted in Uncategorized on January 18, 2017 by Gary. 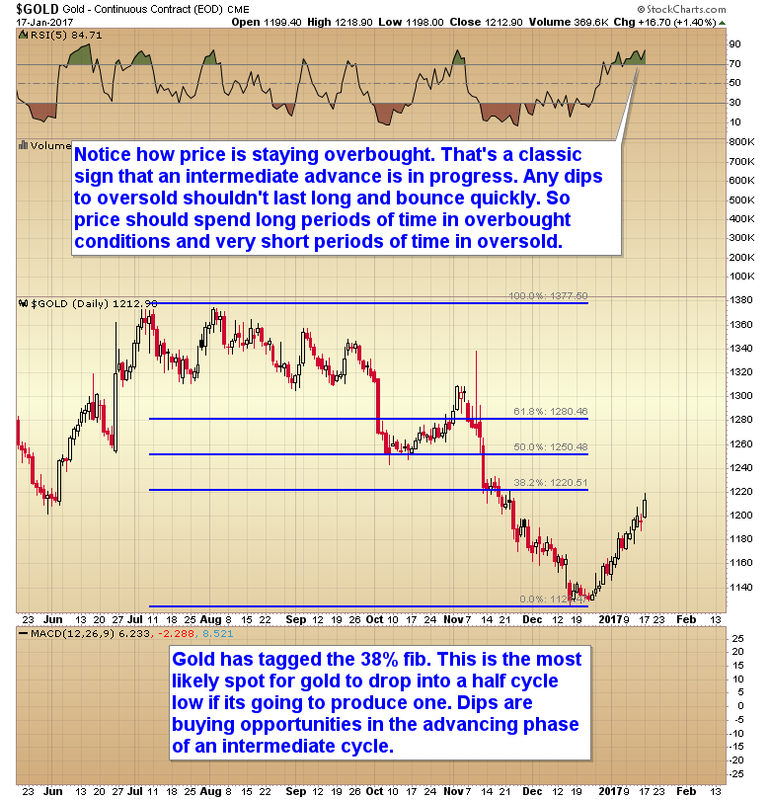 Gold has tagged the 38% Fibonacci retracement of the previous intermediate cycle. This is the most likely spot for gold to drop into a half cycle low if it’s going to produce one. 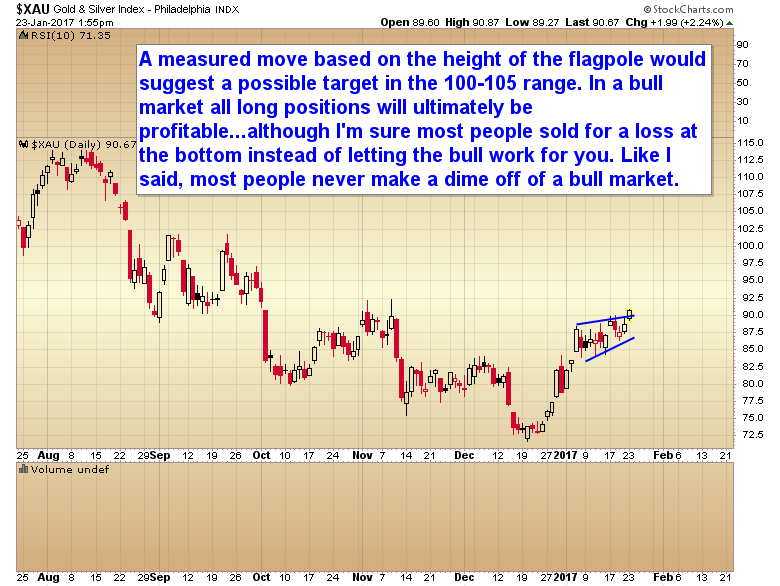 Dips are buying opportunities in the advancing phase of an intermediate cycle. 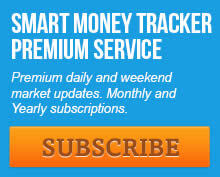 Everybody is going to be caught on the wrong side of this market ad sentiment is excessively bullish. The dollar is going to be due for a 3 year cycle low sometime in 2017. This entry was posted in Uncategorized on January 17, 2017 by Gary. 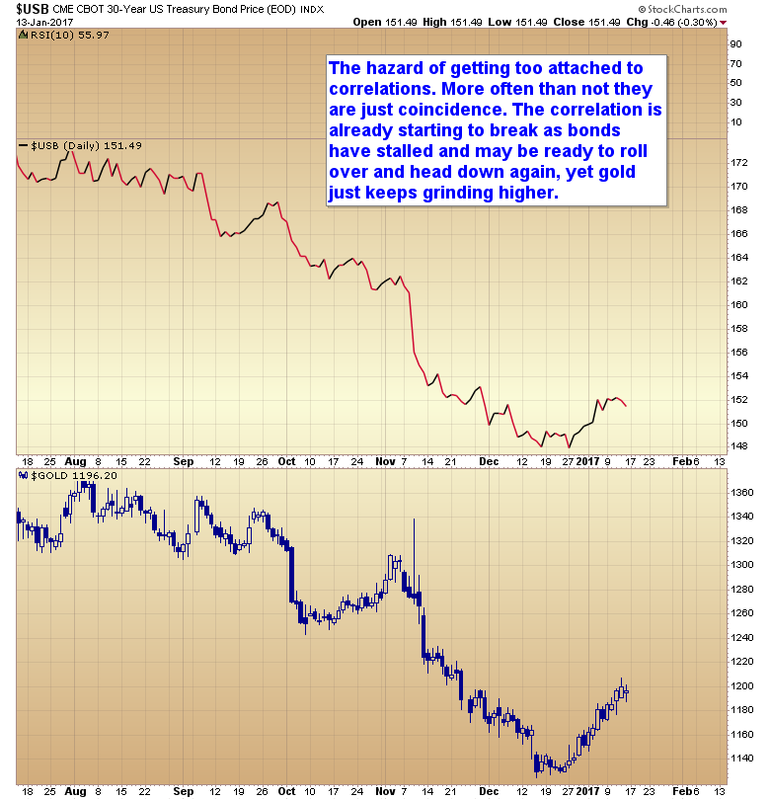 Bonds have stalled and may be ready to roll over, yet gold just keeps grinding higher. This entry was posted in Uncategorized on January 16, 2017 by Gary. 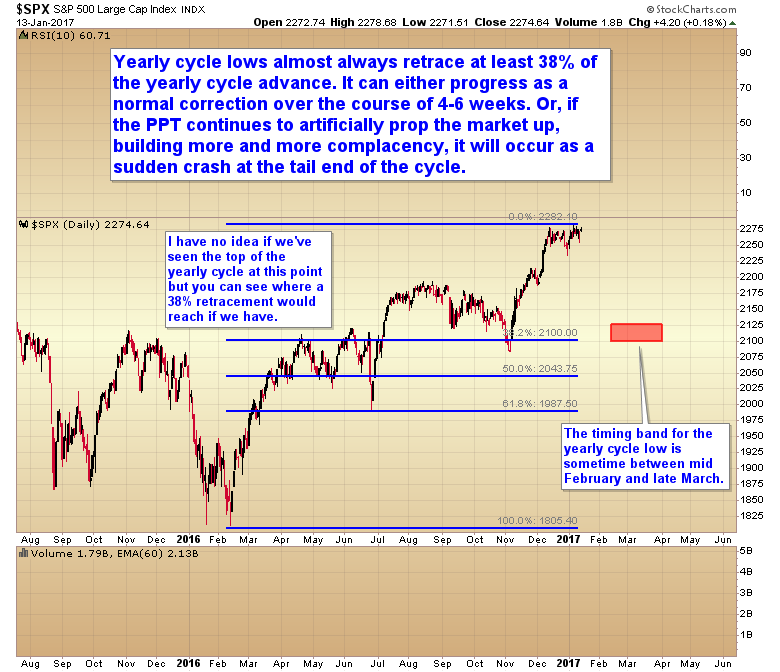 The timing band for the next yearly cycle low in the S&P 500 is sometime between mid February and late March. This entry was posted in Uncategorized on January 15, 2017 by Gary. This entry was posted in Uncategorized on January 14, 2017 by Gary. Now that the intermediate advance is in the second phase the best strategy is to just hang on for the ride. Don’t worry about the daily wiggles. You will never be able to time them perfectly anyway. All you will do is miss chunks of the rally. Just accept that the trend is up, but slower than the initial thrust. But it’s still up and should be for another 2-4 months. This entry was posted in Uncategorized on January 13, 2017 by Gary.